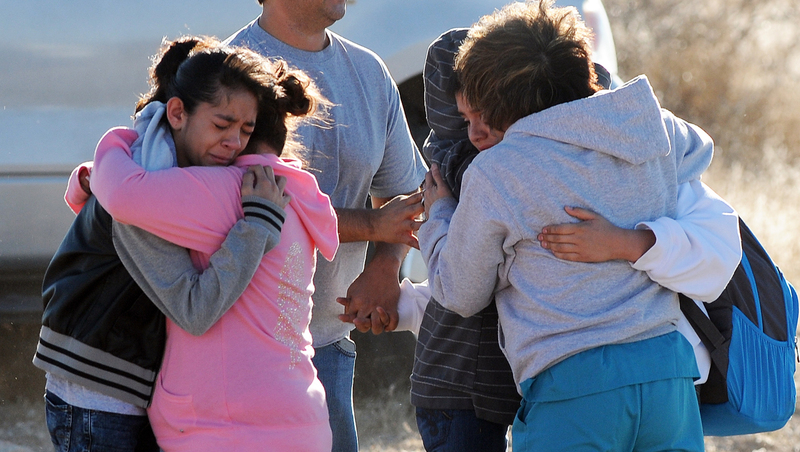 ROSWELL, N.M. - A witness says the gunman in a school shooting in Roswell, N.M. was a student. The shooter wounded at least two students at Berrendo Middle School on Tuesday morning before being taken into custody. Officials at University Medical Center in Lubbock, Texas, say a 14-year-old boy was flown there in critical condition, and a 13-year-old girl was en route in serious condition. Hospital spokesman Eric Finley says information from nurses treating the boy indicates he was the shooter's target. A student who witnessed the shooting says the shooter was a boy who she thought was being bullied. Eighth grader Odiee Carranza says it happened in the school gym. She says the boy shot the 14-year-old twice in the face, and shot the girl in the arm. Carranza says the boy then fired a shot into the sky before dropping the gun. A teacher then grabbed him. CBS affiliate KRQE reports the two students injured in the incident were first treated at Eastern New Mexico Regional Medical before being airlifted to the hospital in Lubbock. Roswell, which is in the southeastern quarter of the state of New Mexico, has a population of about 50,000. The city has been rocked by gang violence in recent years and has asked Homeland Security Investigations to step in and help.